Chicken Legs loves to eat fish tacos. He orders them every time we go to the beach. Since summer is over, I decided to bring a little bit of the beach home with these Asian Fish Tacos. This is another recipe from the new Kraft Recipe Makers. Can you believe these Asian Fish Tacos started with a box? I can't either! The tacos are super simple to prepare. Kraft has done all the hard work by making the sauces for you. All of the Kraft Recipe Makers include two sauces and three recipes. The Asian Fish Tacos included an Asian Ginger Baking Sauce and a Creamy Teriyaki Finishing Sauce. The fish was dipped in the Ginger Baking Sauce and coated in panko bread crumbs. The Creamy Teriyaki Finishing Sauce was used to make a scrumptious Asian slaw. The whole process took less than 30 minutes. To show you how easy it is to use the new Kraft Recipe Makers, I made a video - my very first video! So, what did you think of the video? Are you ready to run to the kitchen and whip up some Asian Fish Tacos? I am ready to make them again after watching the video! The video was a family project. My super talented brother shot the video for me at my house. I couldn't have done it without him! My parents even came up to watch the action. All the food smelled so good while we were shooting the video. Everyone was dying to try the tacos once we were done; even the cats. Fluffy was pacing the kitchen begging for a bite of fish. The tacos received rave reviews from everyone, including Fluffy. You could really taste the layers of flavors in the tacos from the two sauces. My Mom couldn't get over how amazing the slaw tasted. We ended up serving the leftover slaw with dinner that night. I really can't say enough about how delicious these Asian Fish Tacos were. This was my very first time cooking fish and it was a total success! Kraft Recipe Makers made the whole process so easy. I love that I only had to add the protein and fresh produce to the pre-made sauces. 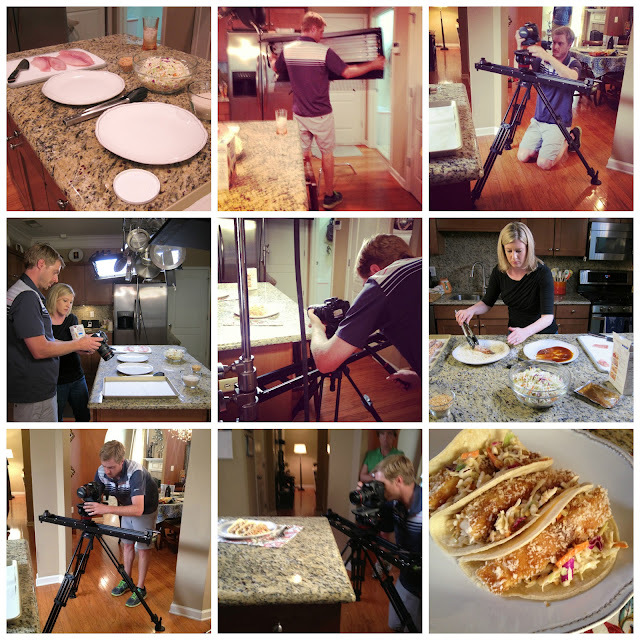 Kraft Recipe Makers allowed me to make some of the best tasting fish tacos we've ever had without spending all day and night in the kitchen! How would you use these sauces to enhance your favorite recipes? Let me know in the comments below for a chance to win a $100 Visa gift card. This sweepstakes runs from 9/9/13 - 10/27/13. sounds like a thin pork chop would work the same way...on a bun with the slaw. yum!! I would use them for a pork dish. I haven't seen these sauces in my store yet, but would love to try them to add some new dishes to our menu! 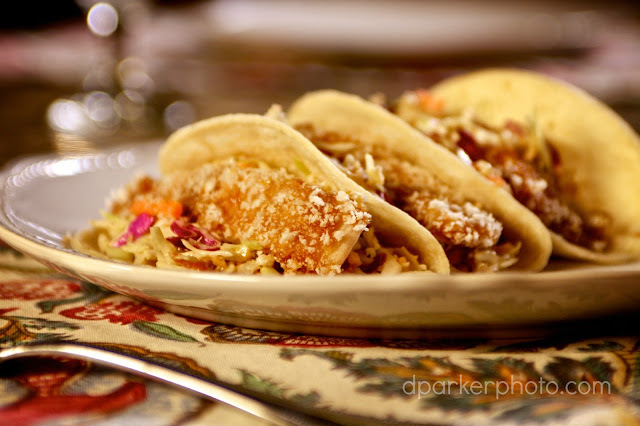 I would love to try the same recipe using chicken for Asian chicken tacos! But I will definitely make the Fish tacos-hubby loves fish tacos. I would use the sauces to make turkey lasagna. I would use this for chicken and make a chicken oriental salad similar to one at a restaurant chain. Great job on the video. Hope we see more of these. We love fish tacos too! I would try Kraft Recipe Makers the next time we have them. I have used the Chicken Cacciatore one and LOVED it (just changed up the veg). Can't wait to try the taco one, although I may do a mixture of fish and shrimp. yummmeeee. Great job on your first video Steph! Can't wait to try the Kraft Recipe Makers. I can't wait to try these! I think it would be yummy to use some shrimp instead! I'm wondering how the creamy teriyaki sauce would be on pasta, for my non-cabbage eating bunch? Fish Tacos sound great but I think I would try the Tex Mex Chicken Fajitas Sauce first. I always buy them in restaurants but I have never tried them at home because I did not think I would be able to duplicate the flavor. great job on the video, wish they showed you not just your hands. we will definitely try this, looks good. I love fish tacos and these look easy and great. The video is awesome. The fish tacos sound really good and this is the second slaw recipe I've seen recently that calls for peanuts. I'm anxious to try that too! I would probably use the sauce in tacos or some type of pasta casserole dish. I would definitely use it for fish tacos! I am not a fish lover but I do make lots of Thai and Asian dishes! These sauces sound just perfect to use with my curry stir fry I make with chicken! Great video! Absolutely made me want to make the same dish except will use shrimp instead of fish. Will leave slaw as is. Did miss seeing your pretty face in the video though.... And what, no accent?! Great job! I would love to use the verde enchilada sauce on just about anything Mexican. I just wish I could find them in my grocery store!! I will have to look for this at the grocery store. I live in the middle of nowhere so it takes forever for new stuff to get here. I would definitely use this for pork chops ...my chops are always so boring! I just saw these in my store on Sunday. I purchased the Verde Chicken Enchilada one. I guess I will have to try to this one, too, as I've never eaten a fish taco in my life. Your video was so great! I finally found these in my store, tried one with chicken and pasta - it was exceptional, could not believe how good it was coming out of a box. Will be adding these to the dinner menus. Thanks for the heads up, your review made me try them. This looks yummy, Stephanie! I pinned this to my What's Cooking board on Pinterest, user name cfails. They all look great, but I think I want to try the chicken bruschetta first! I would make some teriyaki pork with this add some veggies and it would be delicious! I would love to try and make a Chinese Chicken Salad with the sauces. I'd make a New England pot roast! I've been craving pot roast for the longest, thanks for the suggestion with the Kraft Recipe makers! Very nice video Stephanie. Except for that slight accent, you voice sounds a lot like mine. Anyway, I didn't know this Kraft product even existed. Thanks for the introduction. I'd use the box you used and make exactly what you made. It looks and sounds delicious. I think my hubby would love Asian pork chops. I'd love to try my hand at making fish tacos at home also! My hubby turned me onto them and now I love them, but I very rarely cook fish at home - I'd love to try now that you've inspired me! Your brother did a great job on the video and you did a fantastic job "acting". I was thinking, for a while, that you didn't sound like an Alabama girl (the state, not the team)till I heard you say "375 degrees". Music to my ears and makes me homesick. I've always wanted to try making fish tacos but have been overwhelmed buy the lengthy process. This would make the process so much easier and my boyfriend and I love Asian flavors!! I would try the Verde Chicken Enchilada sauce kit. Add some sour cream, cilantro and avocado. Served with some Mexican spiced beans and eat it up!! Wouldn't it be great to take the fish taco kit and make it with shrimp! I want to use one of their kits to beef up my roast. To be honest, I'm still a little skeptical, because I like to use fresh, chemical free ingredients, but I'm willing to give it a try. I would like to try the Three Cheese Chicken Florentine. Great video!!! I would try these sauces in a Stir-Fry. I think trying it as a salad would be good. But I love tacos so we'd definitely try that. Looks like they have a lot of good options and ideas. Can't wait to see them in the store I shop at. I would use the sauce in tacos (maybe substitute chicken?). I don't care for fish, but I would definitely make some Asian Chicken Tacos. I just saw these at Target yesterday! I should have picked one up. I would like to use the New England Pot Roast Recipe Maker to revamp my beef tips recipe, which I serve over rice. Thanks! I would like to try the fish tacos. My husband loves them. My husband and I love fish tacos! So this would definitely be our first Kraft Recipe Makers to try! I would most definitely use them to enhance my enchiladas! Their recipe for Three Cheese Chicken Enchiladas will be made in my kitchen very soon! I've seen these in the store and wondered if they were any good. Can't wait to try them now. Steph - you all did an excellent job on the production of this, I was really impressed. Love that tripod he used, serious equipment. I'd use the sweet and sour chicken recipe maker -- but use shrimp instead!! veggie black bean enchiladas with the three cheese sauce – oh yes please! I would use the sauces to make lasagna. I would love to use the Sweet and Sour chicken and add in some water chestnuts and green and red bell peppers. I'd serve this ontop of rice. I would use the Tex Mex Chicken fajitas to make some awesome fajitas!! I think I would use it as a base with noodles. I'm thinking the Hickory BBQ beef would be awesome on a pork loin in the crockpot. Using the Kraft Recipe makers would cut down prep time for at least half of my dinners. They look terrific. I would use the BBQ one to make some pulled chicken and use that over a salad with avocado, roasted corn/peppers, and tomatoes for a super flavorful healthy lunch! I'd use this to jazz up my chicken and veggie stir fry. I'd use this sauce to enhance my pasta white bean and spinach dish - thank you. I'd dress up some macaroni and vegetable saute! I would make a baked mac and cheese with the Three Cheese Chicken Florentine. I would make Sweet & Sour Meatballs along with spaghetti and garlic bread! I would probably use the sauce on tacos - my kids love them and is a good way for them to eat fish. I would make a stir fry with the sauces. WHAT A TEAM!!! Such a professional job!! I would make my regular chicken nacho casserole more exciting with Tex Mex Chicken Fajita nacho casserole. Pot roast is a favorite and it would be interesting to see what these sauces would do for it. My favorite recipe is Creamy Sesame chicken noodle and I think the Kraft sauces are going to add a lot more flavors and so convenience to use as well. I would use the sweet and sour chicken recipe makers to make some sweet and sour meatballs. I would use in my garden fresh chicken marinara. I would like to try making the Loaded Fajita Quesadillas with the Tex-Mex Chicken Fajita Sauce. I would use the verde chicken enchilada one to give my enchiladas some extra kick. $100 - that's a lot of fish tacos I wouldn't eat... so that's a lot of beef tacos! I'd use the sauces to spice up some boring recipes and give 'em a kick of flavor. I would use the same one in a stir fry with a slaw on the side. But, I also want to try your fish tacos - they are my favorite! id make asian tacos with the sweet and sour chicken sauce! Im still pretty new to cooking so i dont really have any favorite recipes of my own to enhance- Im still learning from others recipes (like yours lol) but I would love to try to make the Florentine-Stuffed Chicken Breasts with their Three Cheese Florentine Recipe Maker...sounds yummy and I love how easy and quick all their recipes are! Talk about a great way to make a weeknight easier! I’d use the chicken bruschetta pasta recipe maker to simply our romano-encrusted bruschetta pasta dinner- a family fav! I would use the KRAFT RECIPE MAKERS Tex-Mex Fajita Skillet mix to make breakfast burritos. I would try the New England Pot Roast recipe maker and adjust my usual recipe. I'd use the sesame ginger for our Thai fusion fried rice. I would use the chicken cacciatore recipe starter to make cheese and chicken pasta shells. We like Chinese food, but my hubby doesn't like chicken. So I'd use pork with the Sweet and Sour Chicken recipe maker to make sweet and sour pork. I would like to make the stuffed peppers. I would use this in my three cheese pasta bake. I would add them to lasagna, taco and meat dishes. I'd use these sauces to jazz up our weeknight pasta aoli. To make a chicken tetrazinni with these sauces would be a fine idea. I would love to make a three cheese pasta! I would use the sweet and sour chicken to make Shrimp and Chicken. I would use the Chicken Cacciatore sauces to change up my stuffed peppers. I love love love love mushroom stroganoff or vegetarian stroganoff using Gardein "beef" tips and would love to try the New England Pot Roast sauces to see what that recipe would be like if they are vegetarian themselves that is! I would like to try the Chicken Cacciatore and make it with rice. Well...since I've never had fish tacos, I think that would be the first thing I tried! I'd make a pasta bake with fall veggies.